MEDALLION: Poppy-colored serpentine hand carved medallion showing double fish surrounding double prosperity symbol. ACCENTS: Scrimshawed bone globes (one is inlaid wood) featuring a fiery Chinese dragon for "Chi" or energy and sterling silver. 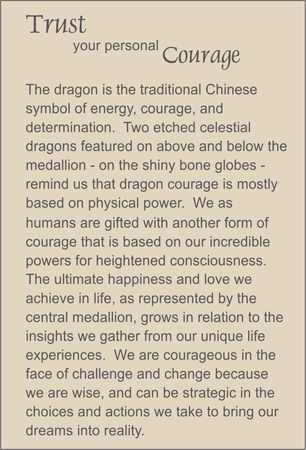 COMMENTS: Let dragons watch over your courage, and keep you focusing your energy where it matters most.